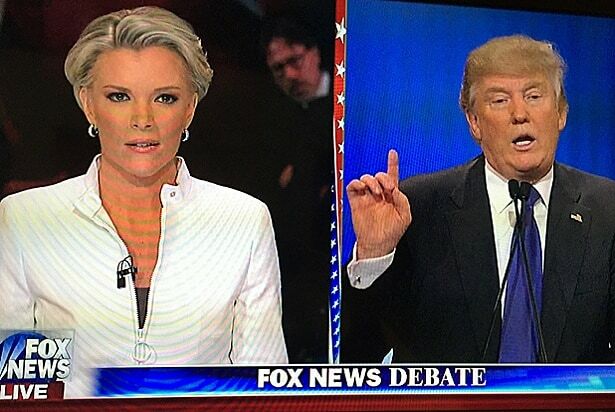 Megyn Kelly calls Trump out on womenTrump famously feuded former anchor Kelly after she asked him a tough question at a Republican primary debate about derogatory statements he's made about women. Trump took it personally, judging by his response on Twitter and in interviews. He later famously said Kelly must have had "blood coming out of her wherever" regarding the question. Watch the debate question here. Kelly to Trump: "Facts matter"Trump kept hammering at Kelly on Twitter and elsewhere. 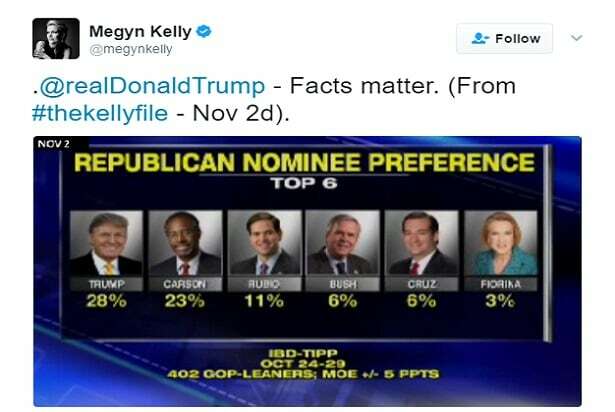 When he called her out for not using the IBT poll when he was leading the Republican primary field, Kelly rebuked him with a tweet showing she did use the poll. "Facts matter," she wrote. Fox mocks Trump with statement on debate skipping pollAfter polled his Twitter followers to see if he should drop out of a Fox-hosted Republican primary debate, Fox responded artfully with a sarcastic statement that it had learned from "secret" sources Trump might be treated unfairly as president by foreign leaders. 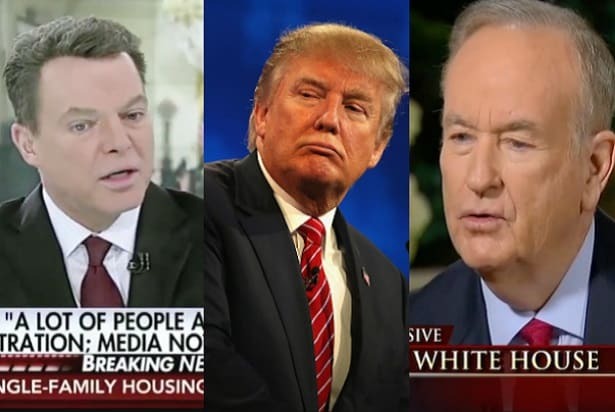 Bill O'Reilly calls out Trump's tweet with totally wrong stats"The O'Reilly Factor" grilled Trump in a Nov. 2015 interview about his tweet that erroneously said black people killed whites at a rate of 81 percent, while whites kill blacks at a rate of 15 percent. O'Reilly told Trump, "You shouldn't tweet." Trump did not take that advice. Shepard Smith backs CNN on Russia reportingAnchor Shep Smith was on Team CNN after Trump's January press conference, in which he refused to take a question from CNN's Jim Acosta, saying, "You're fake news." Smith said, "neither they (CNN) nor any other journalists should be subjected to belittling or delegitimizing by the president-elect of the United States." Watch it here. Chris Wallace bucks Trump calling media "enemy of the public"After his press conference in January 2017, Trump continued his attack on media he doesn't like on Twitter. Anchor Chris Wallace wasn't having it on "Fox & Friends." Wallace said Trump's comments "crossed an important line" and said they were dangerous. Smith calls Trump out on terrorism lieSmith isn't a fan of Trump's false assertions. When Trump said the media "doesn't want to report" terrorist attacks, Smith took him to task. "The White House knows that it was false or could have learned that it was false with a quick Google check, but either did not do so or decided not to tell the truth.” Watch it here. Wallace says the media is too easy on TrumpIn an interview with TheWrap, Wallace said he thinks Sunday political shows in particular should be tougher on Trump. "I think if anything, the media has treated him too well. By that I mean they’ve allowed him to play by different rules." Read the full interview. O'Reilly tells Trump Putin is "a killer"In a February interview, O'Reilly brought up Trump's apparent refusal to criticize Vladimir Putin, calling the Russian president "a killer." Trump famously responded by saying, "What, you think our country is so innocent?" Watch it here. Smith wails on Trump's refusal to talk about Russia hacksNobody on Fox hits Trump harder than Shep Smith. "We have a right to know… You call us ‘fake news’ and put us down like children for asking questions on behalf of the American people." Watch it here. Smith backs CNN and rebukes Trump's 'fake news' assertionTrump's favorite insult against media he doesn't like is to call it "fake news." But Shep Smith again supported CNN against the president after Trump's anti-media speech to the Conservative Political Action Committee. Watch it here. Neil Cavuto tells Trump he's the problem, not mainstream mediaResponding to Trump's tweet claiming the mainstream media wants him off social media, Cavuto called out Trump for losing track of his own agenda. "Mr. President, it is not the fake news media that's your problem, it's you," Cavuto said. Watch it here. Smith blasts Trump administration on Russia: "Lie after lie after lie"Shep Smith was at it again following the news breaking about Donald Trump Jr.'s meeting with a Kremlin-linked lawyer. He took the Trump administration to task for its many lies about meetings with Russia, including Jared Kushner failing to report the meeting on his security clearance forms. "My grandmother used to say, 'What a tangled web we weave when first we try to deceive,'" Smith declared on air, leaving fellow anchor Chris Wallace speechless. Watch it here. Eboni K. Williams slams Trump's remarks about Charlottesville Following the Unite the Right rally in which a counter-protester was murdered, Trump blamed "both sides" for the violence. On "Fox News Specialists," host Eboni K. Williams took Trump to task for not standing up to white nationalists and white supremacists who support him, calling his initial remarks about the rally "cowardly and dangerous." Watch the clip here. Brian Kilmeade calls Trump tweet "ridiculous" blaming U.S. for Russia relations In a rare sight in the lead up to the summit in Helsinki between Trump and Putin, Trump tweeted, "Our relationship with Russia has NEVER been worse thanks to many years of U.S. foolishness and stupidity and now, the Rigged Witch Hunt!" On "Fox and Friends," a show that has been extremely favorable to Trump (he even calls in), host Brian Kilmeade said of the tweet, "That’s by far the most ridiculous tweet of late, and that is insulting to past administrations. He can’t be saying that going into the Russian summit." Watch the clip here. Cavuto blasts Trump's performance in Helsinki: "disgusting" Neil Cavuto took Trump to task more than once after his Helsinki press conference with Putin. When former Deputy Assistant Attorney General Tom Dupree said Trump could have rebuked Putin for his Russia's attack on U.S. elections, Cavuto said, "But he didn’t and that’s what made it disgusting. That’s what made his performance disgusting. I’m sorry, it’s just the only way I feel. It’s not a right or left thing for me, it’s just wrong." Watch it here. Trish Regan says Trump "should have defended us" against Putin Fox Business host Trish Regan got mad about Trump's performance on her show "The Intelligence Report." "He should have defended us," she said. "He should have defended his own intelligence community. Or just don’t take the meeting! Don’t go to Helsinki if you can’t look the guy in the eye and tell him what’s what!" Watch it here.